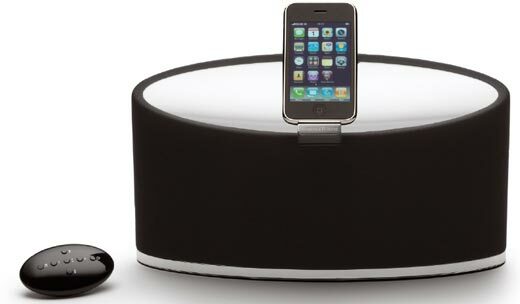 B&W surprised quite a few folk when it released the Zeppelin iPod speaker system. It wasn’t the innovative and sleek shape that caused the shock: anyone who’s ever seen a shot of the company’s Nautilus speakers knows that B&W’s designers can get by without a ruler when they choose. No, the surprise came from the sudden realisation that iPod speaker systems could be cool, while sounding better than any previous expectations led us to believe. The Zeppelin Mini is a far cry from the stunning industrial design of the original Zeppelin, which was left field yet functional. The Mini, while stylish, is somewhat more restrained from a design perspective than its predecessor. 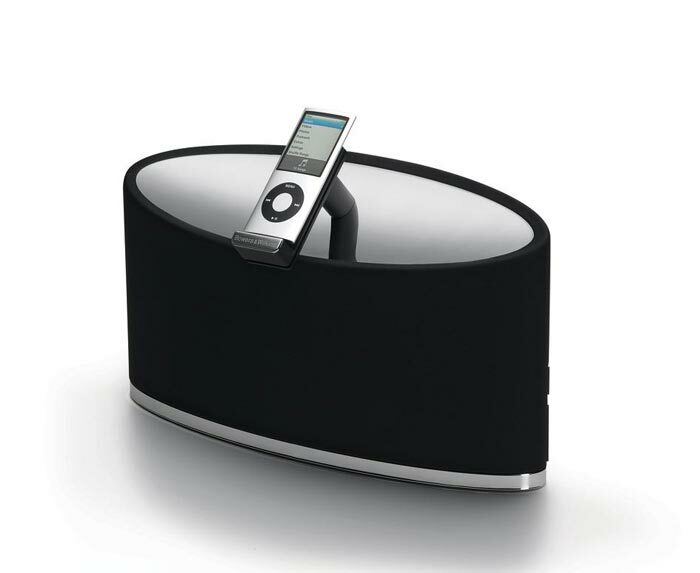 The shiny sliver top surface should probably be a bit over the top, but contrasted against the black body it’s just about right – very elegant and far nicer to look at than the typical slab-sided iPod speaker system. The Mini is powered by a “digital” (i.e. Class D – even though most Class D isn’t actually digital) amplifier helped by Digital Signal Processing, and it has two 75mm full range drivers in a housing vented by one of B&W’s “Flowport” dimpled reflex ports. It features the same clever dock that was pioneered on the original, which pivots through ninety degrees so an iPhone or iPod Touch can be operated in landscape mode to make watching videos easier or to allow Cover Flow to be used. It’s also designed to provide a solid backing to the iPod, so you can operate the controls properly without worrying about putting too much pressure on the dock connector. The curvy remote control is more Zeppelin-like than the Mini Zep itself; it fits the hand perfectly and gives good control of both the Mini and the iPod’s functionality. Unlike many similar systems, there are no unit-mounted controls; everything is driven from the iPod itself or the remote. The Mini boasts another very cool feature – the USB input hiding round the back (there’s a 3.5mm Aux input as well). The USB allows users to feed their computer’s audio files to the Mini’s DAC, which almost always gives a substantial improvement in sound quality. You could argue that this feature is redundant on a device so iPod-specific, but it allows users to easily run two digital sources with remote switching – in my case, my iPhone has a limited selection of music (16Gb doesn’t allow for all that much music storage) so I can dock the phone to charge it while I listen and then switch to the USB input to access the rest of my collection from my MacBook Pro. The USB input also allows the docked iPod to be synced from the host computer. That built-in DAC for the USB input allows the Mini to access the iPod’s digital stream (much like a Wadia iTransport) and bypass the iPod’s own DAC. It’s a nice touch that immediately elevates the Mini into lofty territory… as long as the sound quality matches the promise. I got a surprise when I first set up the Mini Zeppelin. The volume on my iPod Classic was set too high and the playback levels that burst out of the unit, along with a tall soundstage right in front of my face, really threw me for a second. I couldn’t quite figure out where all that sound was coming from, and despite its small form factor, this device really can generate some noise. It goes loud enough to fill a small room with no trouble at all. The Mini is punchy and tight enough to really do justice to music played hard; surprisingly, the small drivers go more than deep enough as well – making a very good effort with music packed with deep bass from the likes of Big Boi, Wyclef Jean and Tupac. The overall bass quality is actually really good with little overhang and minimal booming as long as the rear mounted port is kept clear of a wall. It’s not all about volume and deep bass though: the Mini is refined and easy to listen to, sounding far closer to a decent speaker system than seems possible. The effect of the small cabinet is of course a single sound source, with a soundstage that is both short and narrow despite the dual drivers, but this is hardly onerous and is typical for the genre. What’s not typical is the excellent sound. Vocals and instruments are deftly handled and there’s more than enough resolution and detail available to distinguish well- recorded tracks from their lesser brethren. Where some iPod speaker systems inadvertently homogenise the music to make every song sound as if was recorded in the same studio, the Mini gives a fair degree of insight as to the nature of the music. From the aforementioned rap and hip- hop to the delicate sounds of early Neil Young’s After The Goldrush or soaring tracks from Beck’s Sea Change, the Mini always delivered the goods. Not exactly identical are they? For a one way speaker system, the treble is nicely extended, albeit with a touch of the brightness that seems to be part of B&W’s acoustic language at the moment, which is strange seeings as there are no tweeters in the system. This isn’t a negative in this case because it’s very limited in its effects and is only really noticeable on nasty bright recordings. Bright sounds bright, which makes sense. Interestingly enough, I found the USB input to sound marginally cleaner and more open than the docked iPod. You’d think it would be the other way round given the vagaries of the USB connection and the presence of a length of cheap cable. B&W’s Zeppelin Mini isn’t exactly laden with mainstream features; there’s no radio, no equaliser, no display, no clock or alarm and it isn’t portable. There are some minor ergonomic glitches with the lack of onboard controls but all up, these were non-issues to me; they may well bother you. 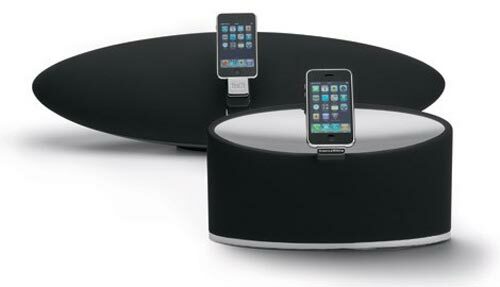 This unit is set up first and foremost to play digital music and it does a fine job.